If you want to have the best moments during summer, then you should consider getting a kayak and head over to the waters to enjoy yourself. However, you may have some difficulties getting the best kayaks in the market. This buyer’s guide will take you through some of the best inflatable kayaks that you will find in the market and factors to consider before buying your kayak. This is one of the ideal Kayaks for three people. It weighs 26-lbs. The package also comes with two AB30 paddles and two inflatable, movable and removable SEC seats. It also comes with a foot pump and a carry bag that has a convenient shoulder strap.The Sea Eagle SE370 has five deluxe one-way inflation and deflation valves. It is made with two skegs on the bottom that helps in tracking and speed. The Eagle has lashed down inflatable spray skirts, stern and grabs line. This kayak will amaze you with its setup time. It will only take you less than 5 minutes to setup the Sevylor Quikpak. It is built with a compact design. Its backpack turns into a seat. It is durable since its bottom is built using Tarpaulin that protects it from punctures. The multiple chambers will guarantee your safety in case one chamber gets a puncture. Its valves use two locking points for ease of inflation and deflation. 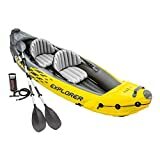 The Intex Explorer is a 2 person inflatable Kayak that will make you spend time with your friend during those hot days. It comes with inflatable seats that have adjustable backrests to make you feel comfortable. The Intex is made to serve you for long, thanks to its rugged 30-gauge vinyl. It is safe to use in both mild rivers and lakes. One thing that you will first notice with this Stand up Paddle Board is the convenient deck handle that makes it easy for you to carry this kayak. The package includes a 2.17M adjustable aluminum oar, hand pump, travel bag and a surf leash. If you ever wish to get a kayak that you will spend less time inflating, then Driftsun Voyager is the best for you. 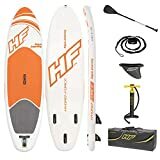 The deluxe high flow action hand pump will help you inflate it in no time.You will not have to worry about carrying your kayak from one point to another. It is built in a compact design that makes it easy to carry. Getting a durable kayak will save you big time. The bottom of this kayak is built from heavy-duty PVC tarpaulin. This will protect it from punctures while it is tough 840D coated nylon fabrics top will protect it from any wear and tear. Its threaded Boston valves will guarantee you security since they do not leak.Its pointed nose entry will guarantee you superior performance in both calm and choppy glasses of water. If you just want to cruise comfortably, then this kayak has High-quality EVA padded seats, which offer back support. This is a nice kayak for you and your two friends. It can carry three persons at once. It comes with two inflatable seats. The bottom is built with two skegs for tracking and speed. The package comes with a foot pump and a carry bag that has a convenient shoulder strap. 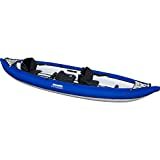 This Sevylor kayak has some amazing features that you may consider when getting your first kayak. The first thing is safety; it is built with multiple air chambers that allow another chamber to stay inflated in case one gets a puncture. The paddle holders secure your paddles and hold them into place. The airtight system ensures that there is no leakage. If you love fishing then this kayak comes with quick set rod holders for hands-free fishing and trolling motor fittings to expand your fishing capabilities.The Sevylor is durable because it is built with 1000D tarpaulin and 840D nylon cover that protects it from punctures. This 9-foot kayak is built in a good design for use in lakes and moderate white water. It is lightweight and constructed in a compatible manner to make sure it’s portable. 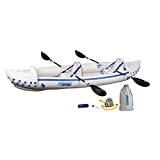 The three air chambers will guarantee you safety since they are enclosed by rugged 840D nylon.This kayak has UV and water resistant coating to make sure that it lasts longer. During summer, you can have the best moments with your friends in a three-person kayak. Its heavy-duty PVC rugged construction makes it safe for lake use. The multiple chambers allow others to stay inflated in case one gets a puncture. The airtight system will ensure that there is no leakage. It has double threaded Boston Valves for easy inflation and deflation. The tarpaulin bottom protects it from punctures and guarantees you durability. The adjustable seats will give you the comfort you need. The Sevylor has spray covers that block splashes to help you stay dry. 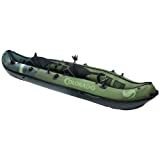 This 2-3 person kayak weighs 35 lbs and is made of 600D polyester fabric and Duratex heavy-duty polyester fabric. It built using proprietary X beam technology PVC floor that inflates up to 12 PSI.The splash guard helps you stay dry by blocking splashes. The package comes with adjustable bungee deck rigging, molded carry handles and rod holders. You should consider several factors before buying a kayak. Below are some of the factors that you should put into consideration. When buying a kayak you should consider getting a compact one because of portability issues and storage. If you have limited space, make sure that you get one that can occupy less space. If you live some miles away from the sea, get a kayak can fit in your car. 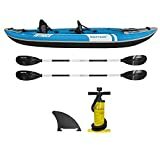 Buying a kayak that has the accessories included in the package will save your money. Some of the accessories you should look at include repair kits, air pumps, a carrying bag, and paddles. Some kayak models will have these accessories included while others may not. This is synthetic rubber is commonly used in making high-end kayaks. This material is durable. This type of material is good for cold environments. It is also considered environmentally friendly. This material is derived from vinyl polymer plastic.The bottom of a kayak is one important part that you should never ignore. A strong bottom will prevent your kayak from punctures that may shorten its lifespan. Getting a kayak that has multiple chambers will guarantee you maximum safety. This ensures that the other chambers stay inflated in case one deflates. You should also consider a splash guard that will prevent any splashes and hence stay dry. One of the hardest parts of buying a kayak is getting one that meets all your needs. However, before getting a kayak you should have in mind the number of people that you like your kayak to carry and the type of waters where you want to use it. 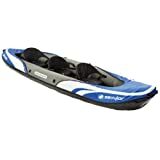 Do you want a river kayak or sea kayak? Your budget should guide you into getting a kayak that you need.